Inequality remains one of the most intensely discussed topics on a global level. As well as figuring prominently in economics, it is possibly the most central topic of sociology. Despite this, there has been no book until now that unites approaches from economics and sociology. Organized thematically, this volume brings international scholars together to offer students and researchers a cutting-edge overview of the core topics of inequality research. Chapters cover: the theoretical traditions in economics and sociology; the global and national structures of inequality in the contemporary world; the main dimensions of inequality (including gender, race, caste, migration, education and poverty); and research methodology. 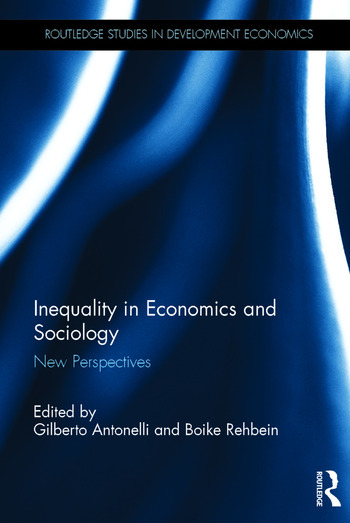 In presenting this overview, Inequality in Economics and Sociology seeks to build a bridge between the disciplines and the approaches. This book offers an encompassing understanding of an increasingly fragmented and highly specialized field of research. It will be invaluable for students and researchers seeking a single repository on the current state of knowledge, current debates and relevant literature in this key area. Gilberto Antonelli is Full Professor of Economics at the Department of Economics of the University of Bologna, Italy, and Chairman of the School of Development, Innovation and Change (SDIC). Boike Rehbein is Professor of the Sociology of Asia and Africa at Humboldt University Berlin, Germany.